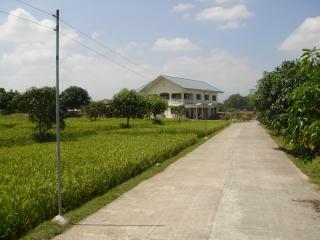 Access to the farm is through Mulawin Heights (through a 174 sq.m. vacant residential lot owned by the Aarnseth's) on one side then along a road right of way that leads to Pascual Street on another. A three meter concrete paved private road traverses the property. The Municipal Hall, the Roman Highway and the commercial, civic, institutional places of Orani are just 10-15 minutes away by private or public transportation. Mobile phone signals as well as wireless internet facilities are available. Subic is just 1.5 hrs. away, while Clark is about 2. Metro Manila is under 3 hrs. 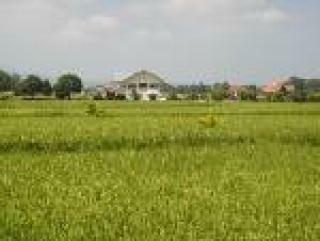 Aarnseth Farm consists of about 3.5 hectares of privately irrigated riceland capable of three harvest seasons per year. It is also planted to fruit bearing mango trees, papayas, pomelos and mahogany. The rest of the area is improved with three duck poultry buildings - 2,400 sqm. floor area, an office/bodega - 160 sq.m., a farmhands quarter - 50 sq.m., a two bedroom flat - 28 sq.m., the Main house & guest's - 387 sq.m. floor area and the swimming pool. Features of the relatively new Main House & guests': a bedroom, toilet/bath, sala, dining room, kitchen, one big stockroom, a covered 2-car garage and a veranda on the ground floor; two bedrooms, 2 toilets/baths, a living room, dining area, bar, kitchen and large terrace on the upper level. The guests rooms complemented with a toilet/bath is at the rear portion of the house and so is the swimming pool. The poultry buildings can house 3,500-4,000 egg laying ducks - these structures are of concrete/gravel, concrete hollow blocks, galvanized pipes posts, wood roof supports under corrugated galvanized iron roofing. Country living at its best, practically a perpect place to retire in, fresh air, very good water source, peace and tranquility far from the hustle and bustle of the world. The whole property is really up at a bargain considering the improvements introduced and its location. An earning proposition actually, a very wise investment for the future.